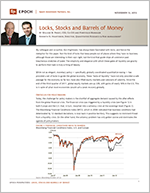 Locks, Stocks and Barrels of Money - Epoch Investment Partners, Inc.
My colleague and co-author, Ken Hightower, has always been fascinated with locks, and hence the metaphor for this paper. Not the kind of locks that keep people out of places where they have no business, although those are interesting in their own right, but the kind that guide ships of commerce past treacherous stretches of water. The simplicity and elegance with which these gates of liquidity use gravity to perform their task is truly a thing of beauty. While not as elegant, monetary policy — specifically, globally coordinated quantitative easing — has provided a set of locks to guide the global economy. These “locks of liquidity” have not only provided a safe passage for the economy so far but, have also lifted equity markets past cataracts of calamity. Since the end of the third quarter of 2011, global equity markets are up 22%, with gains of nearly 30% in the U.S. This is in spite of what most economists would call a weak recovery globally. Today, the challenge for policy makers is the shortfall of aggregate demand caused by the after-effects from the global financial crisis. The financial crisis was triggered by a liquidity crisis (see Figure 1) in both Europe and the U.S. that, in turn, morphed into a solvency crisis at the sovereign level (Figure 2). The Bloomberg Financial Conditions Index (BFCI), which in 2008 indicated that business conditions had deteriorated by 12 standard deviations, is now back in positive territory. This suggests no imminent threat from a liquidity crisis. On the other hand, the solvency problem has only gotten worse and dominates the agenda of policymakers. Elected officials around the world, however, have neglected their responsibilities, leaving a policy vacuum that the world’s central banks have been forced to fill. As a result, monetary policy has replaced fiscal policy. Thus, understanding policy options is the key to understanding inscrutable markets and determining value in the most treacherous economic conditions. Policy is of primary importance to restart the engines of growth around the world. Monetary policy, like the locks of our example, has served its purpose by raising the world economy around the worst cataracts of the global financial crisis. But, just as a boat needs a working engine to continue its journey upstream, so the global economy needs growth to avoid plunging back over the waterfall. Today, that engine is either not working or working at near stall speed. In Europe, policymakers have met the dead engine of growth with austerity, which took precedence over other approaches that might have worked more effectively, such as a deposit guarantee structure for the banking system, and tax and labor reforms. Political gridlock in the U.S. prevented the implementation of any effective fiscal policy measures. Austerity is the metaphorical equivalent of kicking the engine to get it started; strangely satisfying to some, yet rarely effective. Gridlock is an argument over who is going to steer the boat while the engine lies cold and dead; who steers is irrelevant without a means of propulsion. With fiscal policy solutions effectively off the table, monetary policy in the form of “financial repression” — maintaining interest rates as low as possible for as long as possible until there is evidence the real economy is responding — remains the principal policy lever with which to manage the powerful and negative after-effects brought on by the global financial crisis. How will we know when this policy has produced the desired results? The Taylor Rule and its policy implications provide some guidance. In the early 1990’s the raging debate in Monetary Theory was whether or not the monetary authority should use rules or discretion in setting monetary policy. Rules were generally in the form of a k% growth rate in the monetary base to facilitate price stability while the prevailing heterodoxy of discretion advocated moving along the Philips Curve, which specifies the trade-off between inflation and unemployment, to maintain full employment. It was in this context that Stanford economist John Taylor advanced his eponymous rule in a 1993 paper, Discretion versus Policy Rules in Practice. This paper was an attempt to bridge the gap between the two schools of thought in the formulation of a simple systematic policy that the monetary authority might use when setting the interest rate in response to the trade-off between its dual mandates of controlling prices while minimizing unemployment. One immediate problem is in the specification of the output gap, which is notoriously difficult to estimate. The typical approach is to use the Congressional Budget Office estimate. Taylor’s approach was to measure potential GDP by fitting a linear trend to log real GDP from 1984 to 1992. Using a similar approach, we can compare the effective federal funds rate to Taylor rules using the CBO and trend estimates of the output gap. Figure 3A shows actual real GDP, the current CBO estimate of potential GDP, and the long-term linear trend (1947-2012). The first, somewhat surprising, observation is that the Taylor rule using the CBO’s estimate of potential GDP produces a rate that is positive and above the current policy rate, suggesting that current policy is somewhat loose. Using a long-term linear trend produces a rate that is negative and supportive of continued quantitative easing (See Figure 3B). The Federal Reserve has communicated its decision to tie monetary policy to the unemployment rate by keeping rates low until unemployment falls to an acceptable level. This policy prescription can be approximated by increasing the weight placed on the output gap in the Taylor rule. Doubling the coefficient on the output gap leads to a policy rate that is significantly negative and is likely reflective not only of the Fed’s current stance but also those of the Bank of England, European Central Bank and Bank of Japan as well (Figure 3B). This focus on the unemployment rate in a low inflationary environment is an important one and suggests that quantitative easing, with its manipulated interest rates, will be with us for some time. series of locks, this price/earnings multiple expansion largely explains the returns since the market bottomed in early October, 2011. Unless equity investors recognized how these twin insights would play out together, few were likely to beat the indices during that period. Stocks that performed best were those with high levels of beta. It was not a fundamentals-driven equity rally based on earnings and economic growth, giving credence to old adage, “don’t fight the Fed.” Furthermore, the deliberate suppression of interest rates led to a search for yield in other areas of the capital markets. Junk bonds have had one of their best years in recent memory, as have common stocks with high dividend yields. Indeed, when we compare “dividend payers” with little or no growth in underlying cash flow streams to “dividend growers” that have growing cash flows supporting their dividends, the former look excessively valued and the latter look very reasonably priced (Figure 5). With regard to the macroeconomic backdrop, sluggish real growth appears most likely. The International Monetary Fund’s forecast for global growth is 2.7% in 2013. That is just above a stall speed of 2.0%. The U.S. should have some growth, with Japan having even less, and Europe having none. Among emerging markets, China is by far the most influential. Although their growth rate has slowed considerably, it might be bottoming. China, with its new leadership team, has the capability to launch a fiscal expansion, but any such move will likely be much more modest than the one in 2008. Given our view, we anticipate the Taylor Rule will be broadly applied by all central banks in their attempt to revive the sputtering growth engine of the economy. Market multiples are not cheap but neither are they dear. Figure 6 shows the cyclically adjusted P/E ratio for the S&P 500, the so-called CAPE ratio. This long-term measure of value averages real earnings over the past ten years and compares it to the real price of the index. The idea is to create an estimate of value that spans a business cycle. The current value of 21.7, while not particularly cheap by historical standards, is also nowhere near the euphoric highs reached prior to the market crashes of 1929 and 2000. In the past year, company fundamentals have simply been overwhelmed in the marketplace by the consequences of monetary policy. However, in our view, the multiple expansions triggered by these policies are largely in the past. The determinants of P/E ratios — interest rates, equity market price volatility, and future earnings growth assumptions — suggest little likelihood of a meaningful expansion. If economic growth is sluggish, a la the IMF forecast, and organic earnings growth also slows accordingly, that leaves dividends and share repurchases as the drivers of equity returns with the most promise. We mentioned earlier that certain dividend payers appear excessively valued. In many cases, these companies are paying out 100% of their free cash flow as dividends. We are wary of that group. However, dividend growers are quite attractive and are paying out less than half of their free cash flow. Indeed, as seen in Figures 7 and 8, corporate balance sheets are powerhouses today and dividend payout ratios overall are very low. These firms should fare well in a low-growth environment. Source: Federal Reserve Board, Corporate Reports, Empirical Research Partners Analysis. We also expect stocks to provide a better total return than bonds, with free cash flow yields at 60-year highs relative to bond yields (see Figure 9). A plot of the cyclically adjusted P/E ratio verses subsequent ten-year real returns (Figure 10) would suggest that a real return of about 3.5% per annum would be consistent with the market’s current valuation. This is much better than the 1.8% nominal return (and negative real return) currently on offer from 10-year U.S. government bonds. Equities, after all, are a hedge against inflation and they capture productivity growth. No other asset class does both. Thus, given the prevailing approach to monetary policy, equities should outshine bonds in both the intermediate and long term.